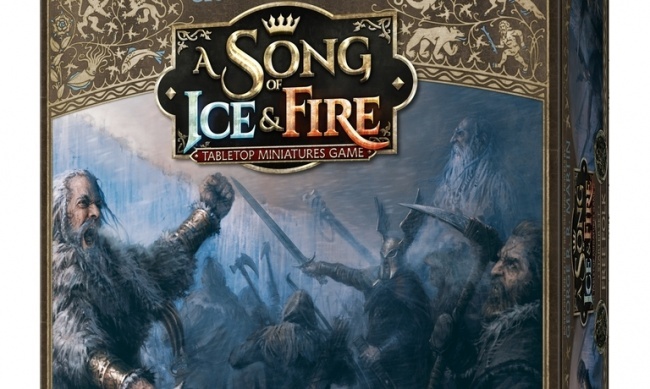 On November 23, another new faction will march into the A Song of Ice & Fire Tabletop Miniatures Game when CMON releases the Free Folk Starter Set, supported by the Game Night Kit #02 and five new expansion sets. The release of the new starter set will also be supported by the second Game Night Kit for A Song of Ice and Fire: Tabletop Miniatures Game. Intended to support in-game tournament play, this kit offers exclusive prize support including alternative sculpt models, a dozen each of Conscripts and Spearwives, plus 4 Night’s Watch dice bags, 4 Free Folk dice bags, 4 Night’s Watch measuring sticks, and 4 Free Folk measuring sticks. A welcome letter, promotional poster, and sticker are also included. The MSRP for the Game Night Kit has not yet been announced. Hailing from north of The Wall, the Free Folk are more concerned with their nomadic lifestyle than the squabbles between the great Houses. But when they venture south, they are viewed as invaders. With the Free Folk Starter Set, players will be able to field an army of these wandering warriors. 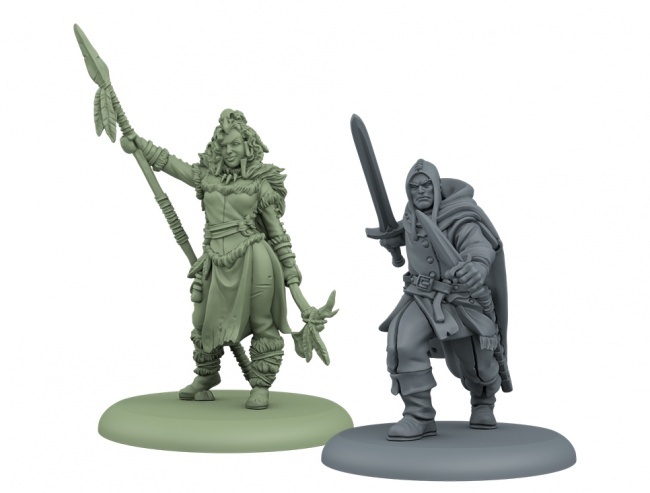 The set includes everything needed to play the game using a Free Folk army, including two complete units of Free Folk Raiders and Savage Giants plus a unit of Free Folk Trappers and characters to lead the army, for a total of 44 miniatures (supplied unpainted). Also included are 84 cards, 1 measuring stick, 71 tokens, 1 board, 11 dice, 5 movement trays, 10 terrain pieces, and 3 castle wall pieces. MSRP is $79.99. The Crannogman Trackers set offer 12 lightly-armored bowmen plus a Crannogman Warden Unit Attachment, plus 1 unit card, 1 attachment card, and 1 movement tray. MSRP is $34.99. The Free Folk Raiders set comes with a dozen of these low-cost but hearty warriors who specialize in swarming tactics and fighting in pairs, led by a Raid Leader Unit Attachment, as well as 1 unit card, 1 attachment card, and 1 movement tray. MSRP is $34.99. Free Folk women are just as dangerous as the men, as indicated by the Spearwives set. This set has 12 warriors plus a Spearwife Matriarch Unit Attachment, 1 unit card, 1 attachment card, and 1 movement tray. MSRP is $34.99. Rounding out the initial Free Folk forces is the Savage Giants set. These oversized combatants are effectively mobile siege engines that get more angry the more damage they take. A pair of giants is included in the set, along with 2 unit cards and 2 movement trays. MSRP is $34.99. The forces of House Lannister also receive some reinforcements in November with the Lannister Halberdiers set, which includes 12 men-at-arms equipped with poleaxes and trained to stand firm against enemy charges. An Assault Veteran Unit Attachment, 1 unit card, 1 attachment card, and 1 movement tray round out the set. MSRP is $34.99. 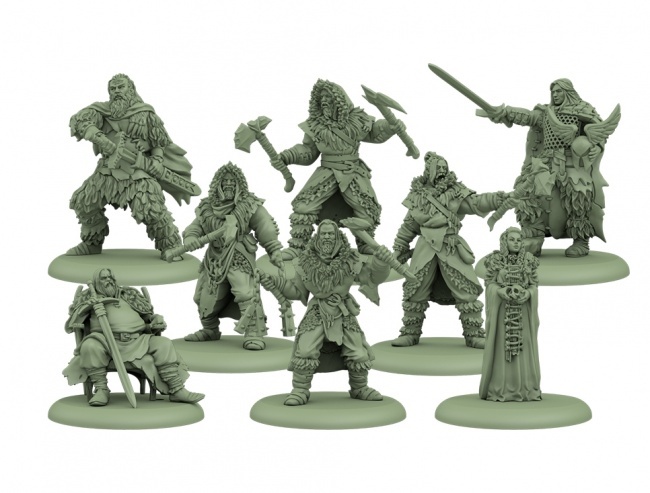 The Night’s Watch is the focus of CMON’s September and October releases for the game (see "Night’s Watch, Heroes Join CMON’s ‘Song of Ice and Fire’").